Investing.com – Germany stocks were higher after the close on Friday, as gains in the Pharmaceuticals & Healthcare, Insurance and Retail sectors led shares higher. At the close in Frankfurt, the DAX gained 0.54%, while the MDAX index gained 0.55%, and the TecDAX index added 0.01%. The best performers of the session on the DAX were Bayer AG NA (DE:BAYGN), which rose 2.54% or 2.45 points to trade at 98.84 at the close. Meanwhile, Linde AG 1 (DE:LIN1) added 2.34% or 4.7000 points to end at 205.3000 and Muench. Rueckvers. VNA O.N. (DE:MUVGn) was up 1.87% or 3.30 points to 179.80 in late trade. The worst performers of the session were Infineon Technologies AG NA O.N. (DE:IFXGn), which fell 2.45% or 0.580 points to trade at 23.110 at the close. Bayerische Motoren Werke AG (DE:BMWG) declined 1.12% or 0.910 points to end at 80.310 and Deutsche Boerse AG (DE:DB1Gn) was down 0.82% or 0.950 points to 114.350. The top performers on the MDAX were Jungheinrich AG O.N.VZO (DE:JUNG_p) which rose 3.82% to 31.560, Rocket Internet (DE:RKET) which was up 2.36% to settle at 26.92 and MTU Aero Engines NA O.N. (DE:MTXGn) which gained 2.01% to close at 162.80. The worst performers were Deutsche Pfandbriefbank AG (DE:PBBG) which was down 7.24% to 12.17 in late trade, Duerr AG (DE:DUEG) which lost 4.83% to settle at 43.150 and Salzgitter AG (DE:SZGG) which was down 3.23% to 39.840 at the close. The top performers on the TecDAX were Isra Vision O.N. (DE:ISRG) which rose 5.74% to 53.40, Morphosys AG O.N. (DE:MORG) which was up 2.44% to settle at 104.900 and Evotec AG O.N. (DE:EVTG) which gained 2.05% to close at 15.165. The worst performers were Siltronic AG (DE:WAFGn) which was down 3.07% to 127.750 in late trade, SMA Solar Technology AG (DE:S92G) which lost 2.17% to settle at 37.880 and Software AG (DE:SOWGn) which was down 2.11% to 40.300 at the close. 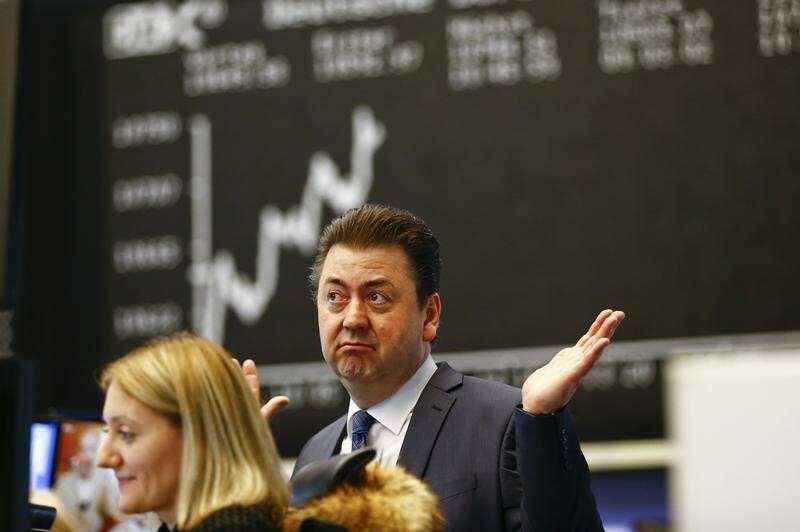 Rising stocks outnumbered declining ones on the Frankfurt Stock Exchange by 393 to 327 and 62 ended unchanged. Shares in Rocket Internet (DE:RKET) rose to 52-week highs; rising 2.36% or 0.62 to 26.92. Shares in Duerr AG (DE:DUEG) fell to 3-years lows; falling 4.83% or 2.190 to 43.150. Shares in Morphosys AG O.N. (DE:MORG) rose to all time highs; rising 2.44% or 2.500 to 104.900. The DAX volatility index, which measures the implied volatility of DAX options, was down 9.72% to 15.82. Gold Futures for August delivery was up 0.01% or 0.10 to $1270.60 a troy ounce. Elsewhere in commodities trading, Crude oil for delivery in August rose 4.56% or 2.99 to hit $68.53 a barrel, while the August Brent oil contract rose 2.45% or 1.79 to trade at $74.84 a barrel. EUR/USD was up 0.29% to 1.1637, while EUR/GBP rose 0.14% to 0.8775. The US Dollar Index Futures was down 0.20% at 94.35.